Krakow currently ranks as Europe’s third most polluted city in Europe, with EU air quality norms regularly being exceeded just over halfway through the calendar year. Particulate matter concentrations eight times over the norm are not uncommon, and, according to statistics, living in Krakow for a year inhabitants breathe in as much carcinogenic benzo[a]pyrene as they would from smoking 2500 cigarettes. All due to the city’s enduring reliance on coal. Last winter, the time of peak smog, a group of parents in Krakow decided enough was enough, and thus was born an initiative called Krakow Smog Alert. The campaign started as a Facebook community page and quickly generated the interest and support of Krakow’s citizens, now totaling over 17,500 people. It was also backed by Krakow’s PR and outdoor media companies who made it possible to run an extensive pro bono billboard campaign drawing attention to the problem of air pollution in the city. 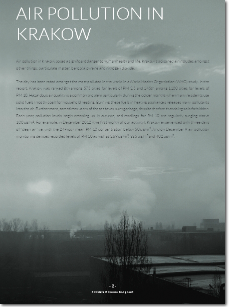 Background to the Krakow Smog alert including a campaign timeline. Krakow’s doctors also rallied to the cause. Every year, estimates reveal, 400 Krakovians die prematurely due to air pollution involving fine particulate matter. Krakow’s children are three times more likely to suffer from asthma than children living in other regions of Poland. Krakow’s medical researchers have also shown that women exposed to high particulate matter concentrations give birth to smaller, lighter children, with lower IQ and higher susceptibility to disease. As the main reason for Krakow’s poor air quality is the use of solid fuels – principally coal – for heating in household furnaces and boilers, Krakow Smog Alert is calling for the city to follow the example of major cities such as London and Dublin by introducing a solid fuel ban that, campaigners are urging, ought to become effective within five years. Roughly 17,000 citizens signed a petition backing the ban and delivered to the regional parliament, the body authorised to introduce such a ban. 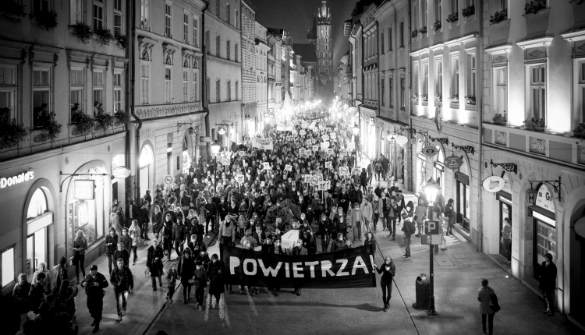 And last month 2000 people took to the streets to urge the authorities to phase out coal from individual heating in Krakow. The overwhelming response from local people to the initiative created a sense of urgency and political space for local decision-makers to seek real solutions for improved air quality in Krakow. Though it seems unthinkable in coal-dependent Poland, the idea was supported by the Mayor and the Council of Krakow. A few months ago they prepared a special subsidy programme for the replacement of coal-fired boilers and furnaces with district heating, gas and electricity installations. As much as EUR 120 million has been already earmarked for this purpose from the EU funds for the 2014-2020 budgetary period, while the local budget for these measures has already increased sixfold and further expansion is planned. A fuel poverty alleviation programme is also being developed in order to shield the less affluent from the effects of the ban. On 30 September, the Malopolska regional parliament adopted – almost unanimously – an ambitious air quality programme that includes the proposed banning of solid fuels (coal) heating for households in Krakow starting in 2018. The regional parliament now has to adopt a resolution that will legally introduce the ban. During public consultations on the resolution, 95 percent of the comments received were in favour of a total solid fuel ban in the city. This pioneering effort, and the stunning progress made against all the odds, has been attracting attention from coal-affected citizens across Poland – from Gdansk in the north to neighbouring Zakopane, a top European mountain resort that also suffers from coal-induced pollution. Affected communities should be aware that, as the acute winter period is fast approaching, Poland is also entering a very opportune moment as far as future EU spending is concerned. At national and regional level, the authorities will shortly be finalising exactly how Poland spends its EU money for the forthcoming 2014-2020 period. 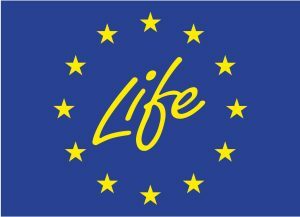 EU money stands to be a lifesaver – literally – in Krakow, and it should now be targeted at air quality measures, as well as domestic energy savings initiatives, all across Poland. 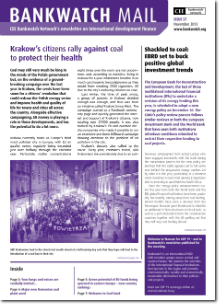 However, as coal is a highly political issue in Poland, there are fears that health risks may well be ignored. In spite of the groundswell of opinion and scientific evidence in favour of the ban, it remains an open question whether during the vote, to take place by the end of November, the regional parliament will listen to the will of Krakow’s inhabitants and authorities and adopt a ban that would give Krakovians hope for cleaner air.